Standardized Soft Neoprene Armrest Covers. The tether attachment system uses durable grommets for simple attachment and compatibility with most armrests. The soft neoprene stretches to fit. 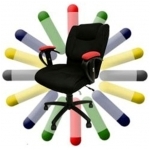 Common Uses: office chairs, wheelchairs, lawn chairs, patio furniture... Pricing is per complete pair. 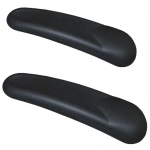 Memory Foam armrest covers are an easy way to upgrade chair armrests of many shapes and sizes. Transform hard factory chair armrests into a pleasantly cushioned surface. High Density Memory Foam cushioning provides superior comfort and support. Pricing is per complete pair. 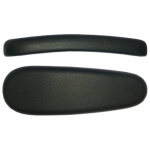 Geo armrest pads with cinch straps offer excellent cushioning and support for those hard plastic armrests. Pricing is per complete pair. Delmar chair arm pads offer arm cushioning with a slightly concave support surface to cradle the arms. Standard size fits many different office chairs. Pricing is per complete pair. Cushion and protect your chair armrests with a pair of custom covers. Size and color options are available. This product is customized for your specifications. 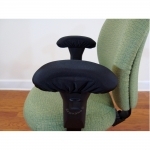 These office chair armrest pads have 3 sets of bottom attachment screw holes: 4", 5.5", and 7" from center to center. Pricing is per complete pair. 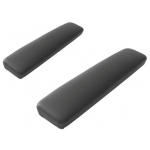 Ultra-soft memory foam chair armrest pads contoured to support each arm with thick high density memory foam. The soft touch black upholstery looks and feels like leather. 2 piece replacement set. 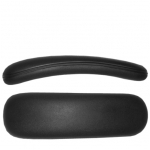 Ultimate Gel Armrests are designed for maximum comfort. 3.5" Wide x 10" Long. 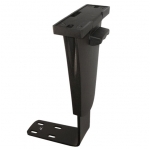 The universal attachment holes are compatible with both 4" and 5.5" center to center screw spacing. Pricing is per complete pair. 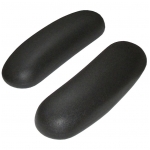 Geo office chair arm pads are among the softest that we offer. They are Durable, Comfortable and Economical. Also referred to as office chair arm rests or chair arm cushions. The bottom attachment screw holes have 4" center to center spacing. Extra Large chair arm pads that are fit for a king. Standard 4" attachment hole set spacing. The soft black upholstery looks and feels like leather. Pricing is per pair. Elbow Friend armrest pads provide instant elbow comfort and arm support. 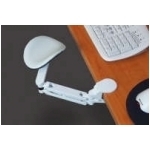 The universal attachment system makes this an excellent choice for all kinds of chairs. Available in a variety of color options. Centric office chair arm rests offer a unique surface design. These arm rests work with many standard office chairs. The bottom attachment screw holes accommodate both 4" and 5.5" spacing. 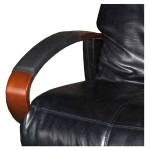 Purchasing chair armrest covers in volume quantity is a great way to save $$! Transform hard chair armrests into pleasantly cushioned surfaces. Thick High Density Memory Foam. Price is for a carton of 12 sets (24 covers). Free Shipping in the continental USA! 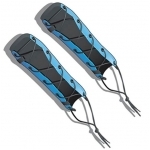 Delmar chair arm pads offer arm cushioning with a slightly concave support surface to cradle the arms. Bottom armrest attachment screw holes are spaced 4" from center to center. 10 Pair (20 Pads) at an Exceptional Price! Free Shipping in the continental USA! Buy a box quantity of 20 pair (40 pads) and save $$! 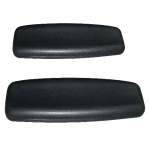 These office chair armrest pads have 2 sets of bottom attachment screw holes: 4" and 5.5" from center to center. Free Shipping in the continental USA! Office chair armrest pads with a touch of style. The smooth cushion surface has a subtle diamond pattern that appears 3-dimensional under light. The attachment screw holes are spaced 4" apart. 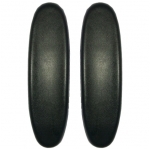 Duro chair arm pads offer a durable design and medium-firm cushioning. A solid steel core runs most of the pad length. The bottom armrest attachment holes are spaced 4" from center to center. These armrest pads are compatible with Eck Adams stackable chairs. Pricing is per complete pair (2 pads). 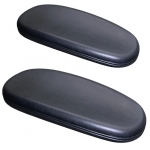 Black wheelchair armrest pads in Desk Length or Full Length. 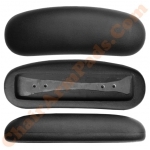 Pricing is per complete set (right and left) of wheelchair armrest pads. 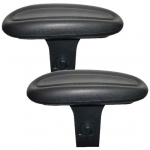 Gator II office chair armrests offer attachment screw holes for both 4 inch and 5.5 inch spacing. These chair armrests are 12" long and 3" wide. Gator II has slightly softer cushioning than Gator I. With its unique shape, Whale goes great lengths to support your arms. These chair arm pads are 12" long and 3.5" wide. 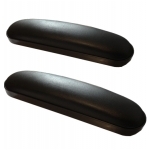 Whale armrests have bottom attachment screw holes that work with both 4" and 5.5" spacing. 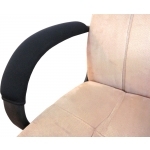 These chair arm pads are very soft and comfortable with an attractive contoured design. The bottom attachment holes are spaced 4 inches apart. 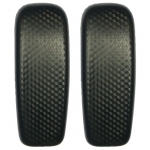 Pricing is per complete set (right and left) of chair arm pads. Standard office chair armrest pads. 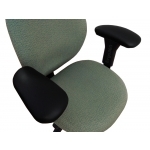 Replace or upgrade existing chair armrests. Top quality polyurethane material. Bottom attachment screw holes are spaced 4" apart from center to center. 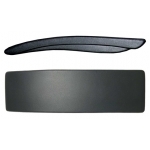 Sunset office chair arm pads are 11" long and have a slightly concave surface to cradle your arms. The attachment screw holes are 4" apart from center to center. 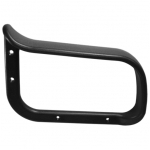 Loop chair armrests are standardized to fit many chairs with this same style. These may be used as replacement armrests. Pricing is per complete set of 2 (right and left). 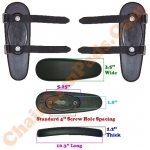 These adjustable height chair arm posts can be used with many different kinds of chair armpads. The arm posts connect to brackets beneath the chair. Pricing is per complete set of 2. Also referred to as "chair uprights" or "chair arms". 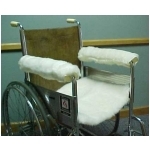 MediWool armrest covers offer cushioned comfort for wheelchair users. These also work great for some office chairs. This plush Merino wool provides an extremely soft surface. Dimensions: 18" long x 8" circumference, closes with velcro. ErgoRest is a fully adjustable arm and wrist support. ErgoRest can relieve strain in the neck, shoulder, elbow, forearm and wrist. Built of sturdy aluminum alloy and tough nylon. Leather upholstered pad. Easy install with adjustable clamp. 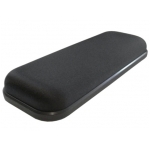 Soft Neoprene Armrest Covers. The tether attachment system is compatible with many chair armrests. Soft neoprene material plus extra foam cushioning. Uses: office chairs, wheelchairs, etc. Pricing is per pair. 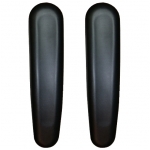 Gel armrest covers are an easy way to upgrade chair armrests of many shapes and sizes. Transform hard factory chair armrests into a pleasantly cushioned surface. Thick gel cushioning provides superior comfort and support. Pricing is per complete pair.